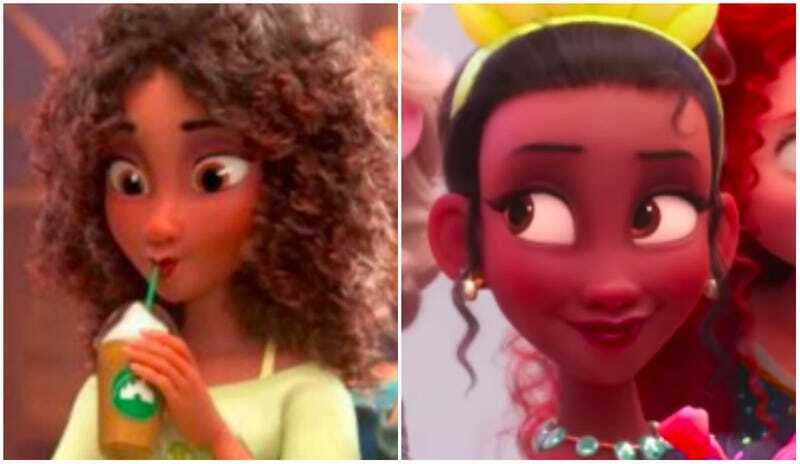 Color of Change: Remember the Outcry Over Princess Tiana's Makeover in Wreck-It Ralph 2? Disney Listened! Princess Tiana before (left) and after (right) a campaign by Color of Change. You know, we relish every opportunity to use our powers for good, so we were thrilled to hear that an article we published last month helped influence some very positive change at Disney, one of the world’s oldest, largest and most revered movie studios (and self-proclaimed creators of “the happiest place on Earth,” Disneyland). After we, several other outlets and commenters on social media spoke out about the seeming whitewashing of Disney’s only black princess (as well as its other princesses of color) in its upcoming Ralph Breaks the Internet: Wreck-It Ralph 2, our friends at racial justice organization Color of Change launched a campaign lobbying the 79-year-old studio to try harder when it comes to representing one of their rare black characters. And Disney took note—of the campaign, our article, and the general outcry regarding the appearance of their formerly dark-skinned, wider-nosed and full-lipped princess, who, through the unfortunate magic of CGI, had been homogenized into a button-nosed, sandy and curly-haired pixie who basically looked like a super-tan version of all the other Disney princesses. As Color of Change’s Senior Campaign Director Brandi Collins-Dexter told The Glow Up, Disney went back to the drawing board, putting in massive overtime—a reported 650 hours per shot—and even bringing on members of the original illustration team from The Princess and the Frog in their attempt to return Tiana’s features to their original glory. In the interim, they removed the offending version from their latest trailer and even invited Color of Change to their Burbank studios last week to preview what we can expect to see when Wreck-It Ralph 2 premieres on November 21 (surprisingly, without any delay to their release date). As Collins-Dexter told us, a revision was more than the Color of Change team had even dared to hope for when they launched the campaign, given the millions of hours and dollars that animated films cost to create. As the largest online racial justice organization in the country (with about 1.4 million members), Color of Change’s influence can’t be underestimated—and they embodied their name quite literally in the handling of this situation. But as a group that started in the aftermath of Hurricane Katrina, it also can’t be ignored that maintaining the integrity of Disney’s first black princess became a personal mission for the studio and the organization; notably, the creators of The Princess and the Frog set the story in New Orleans as a “valentine to the city” after the devastation that occurred there in 2005. As Collins-Dexter shared with us, that personal perspective was also present as the studio worked to course-correct. “One of the things that strikes me about meeting with them that I thought was particularly profound, was they [said], ‘You know, we could have just tried to wait this out and let people’s feelings die down and carry on, but we know how important these Disney princesses are to young girls of color, and we really wanted to get this right, and so we were willing to do what it took to get it right,’” she told us.